The Hegelian-Marxist idea of alienation fell out of favor after the postmetaphysical rejection of humanism and essentialist views of human nature. In this book Rahel Jaeggi draws on the Hegelian philosophical tradition, phenomenological analyses grounded in modern conceptions of agency, and recent work in the analytical tradition to reconceive alienation as the absence of a meaningful relationship to oneself and others, which manifests in feelings of helplessness and the despondent acceptance of ossified social roles and expectations. A revived approach to alienation helps critical social theory engage with phenomena such as meaninglessness, isolation, and indifference. 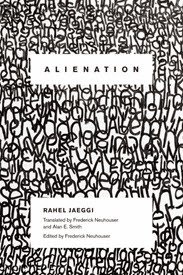 By severing alienation’s link to a problematic conception of human essence while retaining its social-philosophical content, Jaeggi provides resources for a renewed critique of social pathologies, a much-neglected concern in contemporary liberal political philosophy. Her work revisits the arguments of Rousseau, Hegel, Kierkegaard, and Heidegger, placing them in dialogue with Thomas Nagel, Bernard Williams, and Charles Taylor. Rahel Jaeggi is Professor for Practical Philosophy in the Department of Philosophy at the Humboldt University, Berlin. She is the author of "Kritik von Lebensformen" (Suhrkamp Verlag, 2013). And she is co-editor (with Daniel Loick) of "Nach Marx: Philosophie, Kritik, Praxis" (Suhrkamp Verlag, 2013). See the introduction here (pdf). The German edition of "Alienation" came out in 2005, titled "Entfremdung. Zur Aktualität eines sozialphilosophischen Problems" (Campus Verlag). See Frederick Neuhouser's review of the book in "Notre Dame Philosophical Reviews" (2007). A podcast of a lecture by Rahel Jaeggi on "Re-thinking Alienation" is available here (London School of Economics, March 12, 2012). 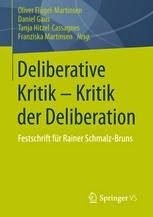 Neues Buch: "Deliberative Kritik – Kritik der Deliberation"
Hrsg. von Oliver Flugel-Martinsen et.al. "In his most recent voluminous work Das Recht der Freiheit (2011) Axel Honneth brings his version of the recognition paradigm to full fruition. Criticizing Kantian theories of justice, he develops a Hegelian alternative which has at its core a different conception of freedom. In this paper, I will scrutinize Honneths latest work to see whether he offers a promising alternative to mainstream liberal theories of justice. I will focus on two key differences with Kantian theories of justice. Substantively, Honneth criticizes the Kantian concept of ‘reflexive freedom’ and proposes instead as the core of his own theory the concept of ‘social freedom’. Methodologically, he proposes a method of ‘normative reconstruction’, and explicitly develops this in contrast to Kantian constructivism. I investigate the robustness of these shifts by seeing how they are actually used in Honneth’s reconstruction of the market sphere. I conclude that his method of normative reconstruction does not provide the kind of guidance Honneth thinks it does. His conception of social freedom fares slightly better but can either be reduced to the mainstream’s idea of reflexive freedom, or else faces some serious challenges. Rutger Claassen is Associate Professor of Ethics & Political Philosophy at the Department of Philosophy, Utrecht University. More papers by Rutger Claassen here. See also seven critical essays on Axel Honneth's book here (Krisis, Journal of Contemporary Philosophy, 2013) and Honneth's reply. 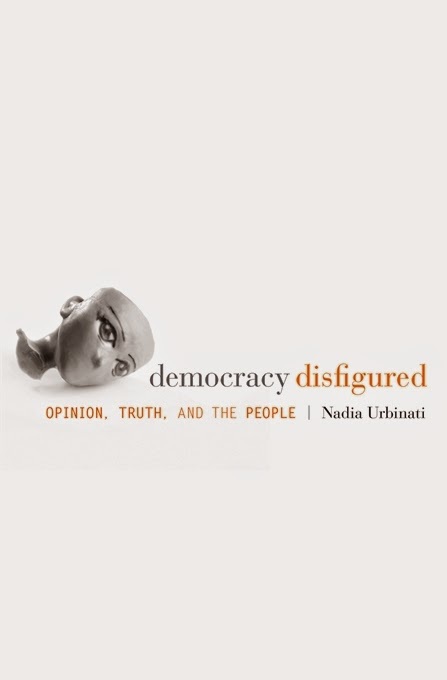 In Democracy Disfigured, Nadia Urbinati diagnoses the ills that beset the body politic in an age of hyper-partisanship and media monopolies and offers a spirited defense of the messy compromises and contentious outcomes that define democracy. Urbinati identifies three types of democratic disfiguration: the unpolitical, the populist, and the plebiscitarian. Each undermines a crucial division that a well-functioning democracy must preserve: the wall separating the free forum of public opinion from the governmental institutions that enact the will of the people. Unpolitical democracy delegitimizes political opinion in favor of expertise. Populist democracy radically polarizes the public forum in which opinion is debated. And plebiscitary democracy overvalues the aesthetic and nonrational aspects of opinion. For Urbinati, democracy entails a permanent struggle to make visible the issues that citizens deem central to their lives. Opinion is thus a form of action as important as the mechanisms that organize votes and mobilize decisions. Urbinati focuses less on the overt enemies of democracy than on those who pose as its friends: technocrats wedded to procedure, demagogues who make glib appeals to “the people,” and media operatives who, given their preference, would turn governance into a spectator sport and citizens into fans of opposing teams. Nadia Urbinati is Professor of Political Theory and Hellenic Studies at Columbia University. She is is the author of "Mill on Democracy" (University of Chicago Press, 2002) and "Representative Democracy: Principles and Genealogy" (University of Chicago Press, 2008). See a video of a panel discussion on Nadia Urbinati's book, Columbia University, March 2014 (with Victoria Murillo, Federico Finchelstein, Maria Pia Lara, Ira Katznelson, and Nadia Urbinati). See also Urbinati's paper on "Procedural Democracy" (2013). "Despite the proliferation of scholarly work on the capability approach, and its wide endorsement as a theoretical framework in a variety of applications, there are very few sufficiently detailed accounts of what the capability approach exactly is. This is unfortunate, since a more robust understanding of what the capability approach is, and what it is not, would be beneficial for both the applied and empirical work, as well as a more solid foundation for advanced philosophical analysis. This paper presents an account of the capability approach that provides that basis: the concentric circles account. The concentric circles account allows us to distinguish what belongs to the core of the capability approach and what does not. It also allows us to see that there is a huge range of capabilitarian theories and applications possible, given that the core commitments can be combined with various (and diverse) additional normative and ontological claims in the outer circles. The concentric circles account also enables us to see why the Martha Nussbaum’s description of the capability approach, which is at present the only sufficiently specific account of the capability approach, is biased and misleading." Ingrid Robeyns is Professor of Ethics of Institutions at the Utrecht University. She is co-editor (with Harry Brighouse) of "Measuring Justice. Primary Goods and Capabilities" (Cambridge University Press, 2010). [See my blog post on the book here.] A monograph by Robeyns on "The Capability Approach" is coming out later this year. * Ingrid Robeyns's article on the capability approach at "Stanford Encyclopedia of Philosophy". * A video with Ingrid Robeyns talking about the capability approach (2013). * Ingrid Robeyns's review of "Creating Capabilities: The Human Development Approach" (Harvard University Press, 2011) by Martha Nussbaum. "Chains of Persuasion in the Deliberative System: Addressing the Pragmatics of Religious Inclusion"
"If one accepts that religious arguments ought to be included in democratic deliberations, three problems immediately arise. First, religious arguments will not persuade those who do not accept the religious premises, so religious arguments do not seem to contribute to deliberative opinion and will formation. Second, democratic arguments will not persuade religious citizens who prioritize their religious commitments ("integralists"), who seem to be excluded from deliberative opinion and will formation. Third, if an integralist makes a religious argument intending to persuade, then she seems to be appealing to an invidious double standard: she expects her fellows to be potentially persuaded by her religious argument when she is not reciprocally open to persuasion on the basis of their comprehensive views. I argue that approaching deliberation from a deliberative systems view provides a powerful approach to each of these three problems unavailable to more traditional understandings of deliberative democracy." Benjamin Hertzberg is Visiting Assistant Professor of Political Science at Brigham Young University. More papers by Benjamin Hertzberg are available here. "Von Horkheimer zu Habermas und in die Neue Welt. Der ethisch-politische Horizont der Kritischen Theorie"
"Eine der überraschendsten und unerwarteten Richtungsänderungen der Kritischen Theorie durch und nach Habermas war sicherlich die eingehende Auseinandersetzung mit dem Liberalismus von John Rawls und Ronald Dworkin. Im deutschen Kontext wird oftmals missverstanden, dass der politische Liberalismus in den Vereinigten Staaten keine Spielart des ökonomischen Liberalismus ist, sondern eine politische Philosophie des Sozialstaats der Nachkriegszeit. Er impliziert eine Form sozialstaatlich abgesicherter und demokratischer Wirtschaftspolitik, ja mehr noch: John Rawls‘ zweites Gerechtigkeitsprinzip, das „Differenzprinzip“, würde – wenn jemals institutionalisiert – zu der radikalsten Umverteilung von Reichtum und Neuordnung vieler öffentlicher und privater Institutionen führen. Darüber hinaus liefern uns die Arbeiten von Rawls und Dworkin die umfassendste philosophische Rechtfertigung konstitutionell verfasster liberaler Demokratien. Ich habe mich oft gefragt: „Was wäre die Haltung Max Horkheimers zu diesen Denkern gewesen?“ Und meine Antwort war, mit Horkheimer gesprochen: „Im Gegensatz zum Irrationalismus versucht der Materialismus die Einseitigkeit des Analytischen aufzuheben, ohne es zu verwerfen.“ Es ist eine der größten Leistungen zeitgenössischer Kritischer Theorie, die Grenzen des Rawlsschen Paradigmas distributiver, umverteilender Gerechtigkeit aufzuzeigen, und es zu ergänzen mit Formen der Missachtung durch Ausgrenzung, die sich auf Geschlecht, Hautfarbe, Ethnizität und sexuelle Neigung beziehen." Futher information on the event here. Updated entry on Habermas in "Stanford Encyclopedia of Philosophy"
by James Bohman & William Rehg. "Transnationalization of Democracy” (100 minutes). Habermas presented the same paper at Princeton University on May 1, 2014. A video of this lecture is available here.